Many mediators prefer kneeling meditation— known as seiza meditation—as opposed to the”lotus” cross-legged meditation position. Some seiza meditators kneel on cushions, while many others use seiza benches. 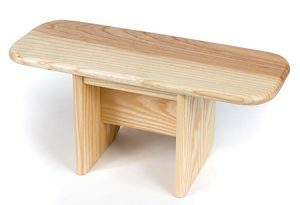 The Pi Meditation Bench is a unique, elegant, and simple seiza kneeling bench that offers greater comfort for seiza meditation. The design is so special, you’ll wonder why nobody thought of it before now. 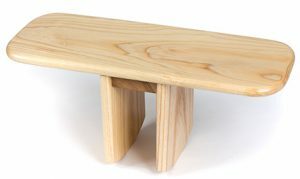 The Pi Meditation Bench, shown to the left and above, allows you to kneel with your feet comfortably positioned under the bench and outside of the bench legs. This allows you to easily position your legs under the bench and to kneel comfortably in the seiza position for extended periods. 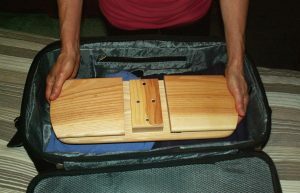 Conventional meditation benches—as shown to the right—have bench legs configured on the outside, constraining your kneeling position to place your legs inside the bench legs. Sitting on and placing your legs under a conventional bench can normally be done only by picking up the bench. The Pi Bench has no border on the outside, as opposed to conventional benches. So there is no constraint to your calves, meaning your legs and feet are maintained far enough apart to create a stable platform for good seiza meditation posture. Available in 3 models, read below about the Original Pi™, the Pi-To-Go™, and the Xtra-Pi™ meditation benches. The Original Pi™ Meditation Bench is designed to foster correct spinal, physical and energetic alignment without placing stress on the knees. Most of the meditator’s weight is distributed on the “sit bones” (ischial tuberosities). The curved, contoured base of the Original Pi™ allows you to adjust your kneeling position to find the correct angle of your “sweet spot” for comfortable meditation. 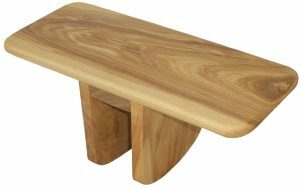 Each 7-1/4” tall bench is handcrafted in beautiful select hardwoods and has a quality semi-gloss finish. A folding bench that’s light and can go anywhere! The Pi-To-Go™ Folding Meditation Bench is a foldable version of the Original Pi™. The Pi-To-Go™ has an elegant locking mechanism to secure the bench when unfolded. This foldable bench—2 inches thick when folded—easily fits into an on-board bag. So you can conveniently take your Pi-To-Go™ wherever you travel! Like the Original Pi™, Pi-To-Go™ bench leg contours allow easy sitting adjustment to each person’s needs. A bit taller and a bit wider, with a choice of leg shape. 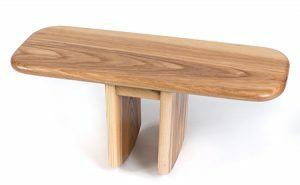 Many people have commented that our Pi Benches are the most comfortable meditation benches available. Some meditators have requested if the bench could be just a little taller. Others have asked to widen the bench stance. And some people requested the legs to be flat to the ground, instead of rounded. – both flat and contoured edges on the bench legs. By facing the bench the way you want, you can turn the bench to either the contoured side of the legs or the flat side of the legs. This allows you to choose between adjusting your sitting “sweet spot” or kneeling with a more fixed feeling. All of our Pi benches are handcrafted in beautiful, select hardwoods. Each bench is finished with a quality, durable, semi-gloss lacquer coat. 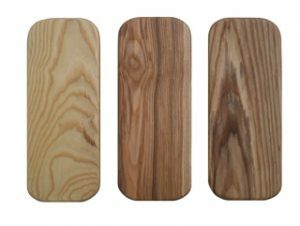 The wood color can naturally vary from a warm honey ash to natural oak color. Each bench has a distinctive wood grain appearance, making this uniquely your bench. 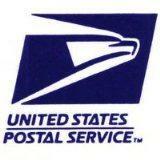 US Continental Ground shipping is FREE (48 states) for orders over $125! Most of our meditation bench shipments are by USPS. US 48 states Ground shipping for orders under $125 is $14.95. 3-day shipment within the Continental US — please add $16.50. Regular shipment to Hawaii and Alaska — please add $18.50. We now ship our Meditation Benches internationally. Click here to learn more. Check some of our FAQ’s. Is there a need to cushion the sitting surface of the Pi Meditation Bench? While some conventional meditation benches have additional cushions for the sitting surface, many of our customers use the Pi Meditation Bench without a cushion. We’ve found that using our bench without a cushion is preferable. Unless a cushion is fixed in place (in which case, it cannot be cleaned) it can tend to shift as you sit upon it. Instead, we recommend to those that feel they need to have some cushioning, to cut out an inexpensive yoga mat for the top of the bench to enhance the bench sitting surface. Do you have recommendations for starting a meditation practice? There are a few styles and methods to meditating. Please refer to our article on Floor Sitting and Meditation – Practical Points, which touches on a practical points regarding floor sitting and how to make your meditation sessions more effective. What is the signficance of the name “Pi” for your benches? Simple! Our benches, having a shape with two centrally-configured legs, resembles the Greek letter “pi” π. Is it mandatory to use the Pi Meditation Bench with a cushion or zabuton? Many of our customers prefer to rest their knees and place the Pi Meditation Bench on a soft surface, such as a carpet or cushion—but this is not mandatory. In every case, the key to proper meditation is to find the seiza posture/position that is most comfortable for you.